Prepare yourself for the heart-racing experience of rocketing across one of tallest bridges in Florida! See for miles in all directions as if you were flying across Tampa Bay! This tour will be the experience of a lifetime! You just never know...if the timing is right...we might drive right over the top of a cruise ship as it passes beneath the bridge! This tour is not to be missed and definitely not for the squeamish! 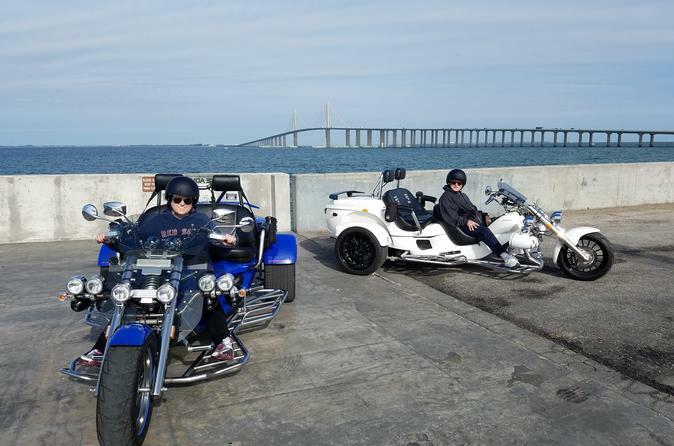 Ride across the picturesque Sunshine Skyway Bridge on a three-passenger motorcycle. During this 2-hour tour, you'll also venture over the Gandy Bridge, which boasts panoramic views of Old Tampa Bay. You're sure to have a thrilling time on this motorbike tour, which departs from the Port of Tampa. Choose between a morning or an afternoon departure at booking. When you arrive at the tour operator's base in the Port of Tampa, meet your personal driver/guide. Then strap your helmet on, take your seat aboard the three-passenger motorcycle, and set off. Take in the harbor views of Tampa Bay as you make your way to the Gandy Bridge. You'll cross over and continue to the officially named Bob Graham Sunshine Skyway Bridge, a cable-stayed bridge that connects Tampa to St. Petersburg. Once you arrive at one of the tallest bridges in Florida, prepare yourself for incredible panoramic views. Soar across the bridge for a heart-racing thrill and keep an eye out for any cruise ships passing underneath. After a photo stop, you'll head back to the Port of Tampa, where your 2-hour tour concludes.